Good food and good company is exactly what you’ll find when you walk into a small gourmet food shop called Dags & Willow. Tucked away in the beautiful town of Collingwood, Ontario it’s a place you must visit on the way to a summer cottage in Georgian Bay, or before you hit the slopes in The Blue Mountains. Dags & Willow began when a couple of cheese enthusiasts, Steven Epstein and Kelly Siskind, thought it would be fun to sell their favourite cheeses at the Collingwood Downtown Farmers’ Market. Ten years later they’re now a shop across the street with a full-service kitchen for catering and home-cooked meals, and a distribution arm. When you enter the Dags & Willow location on 25 Second Street it’s hard to imagine that it used to be a soda factory. 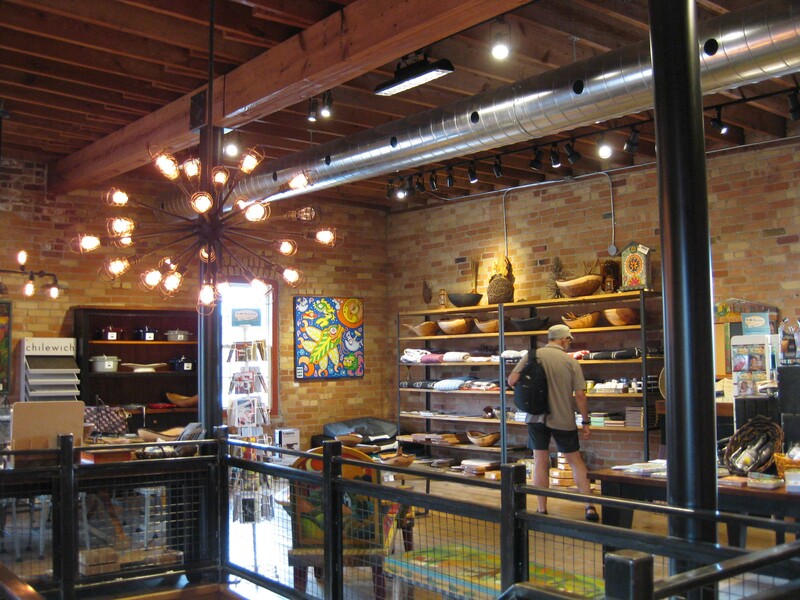 The place has a warm, rustic, loft vibe with its exposed brick and natural wood paneling. When renovating the hundred-year old building they salvaged whatever material they could, keeping the original Hemlock flooring, and the floor joists that now make up the staircase. It’s the kind of shop you don’t mind spending hours in. 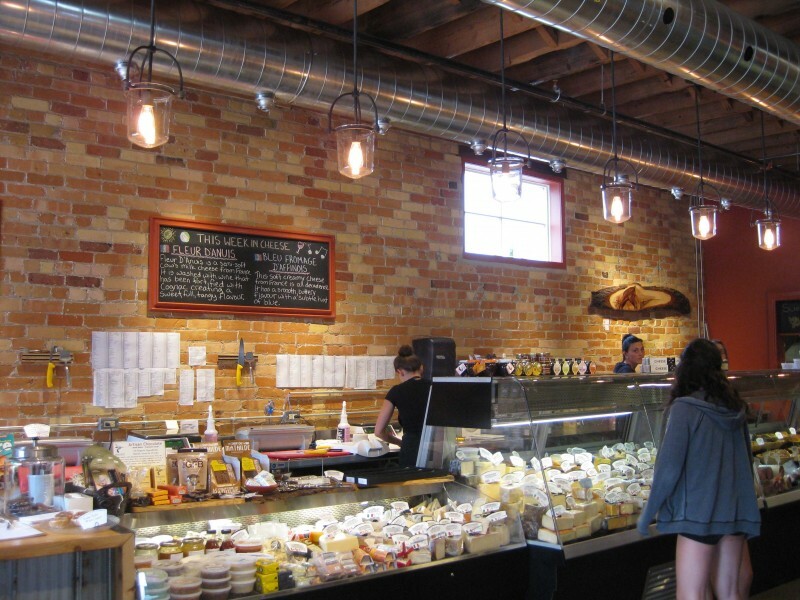 But what really makes Dags & Willow special is the food – it’s the shop that cheese built. Steven is like an encyclopedia of cheese, with knowledge of every type of cheese out there, while Kelly is like a biography, an expert on the history and art of making cheese. Together they’ve tried over a thousand cheeses to find the best ones to put in their shop. When asked what they specialize in, Steven simply says, “Good Cheese”. 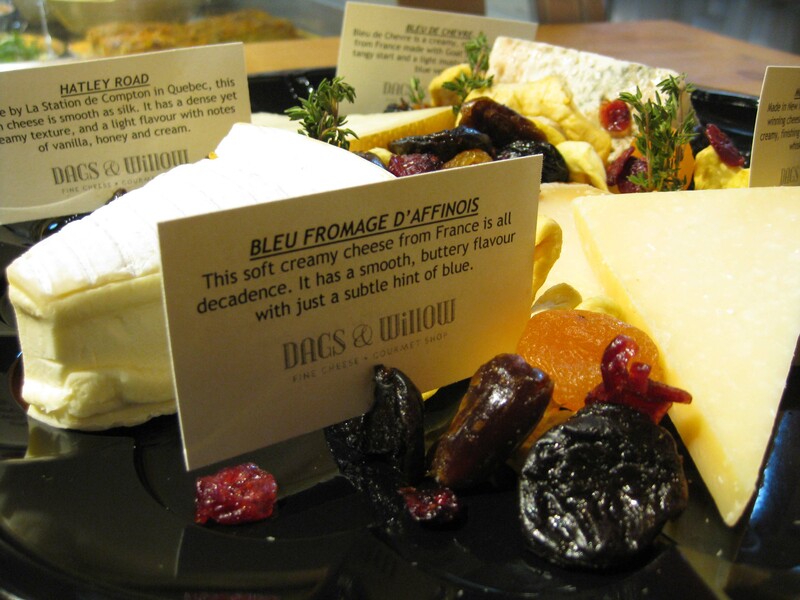 At any given time Dags & Willow carries 130 different cheeses from around the world, varying by season and availability. A popular cheese only available in winter is Vacherin-Mont d’Or. A soft, raw cheese made from cow’s milk it comes in a round spruce box, which it has spent 3 months ripening in. It looks like a gift from the cheese Gods and tastes like one too with its rich and buttery flavour. Fortunately, one of the most unique cheeses you must try at Dags & Willow is available all year. The Dragon’s Breath Blue from Nova Scotia is a blue cheese without the mold, but with all of the sharp bite! It comes in a distinct black wax casing, which is what helps create this unique no-mold blue. Every cheese at Dags & Willow was chosen for a reason. 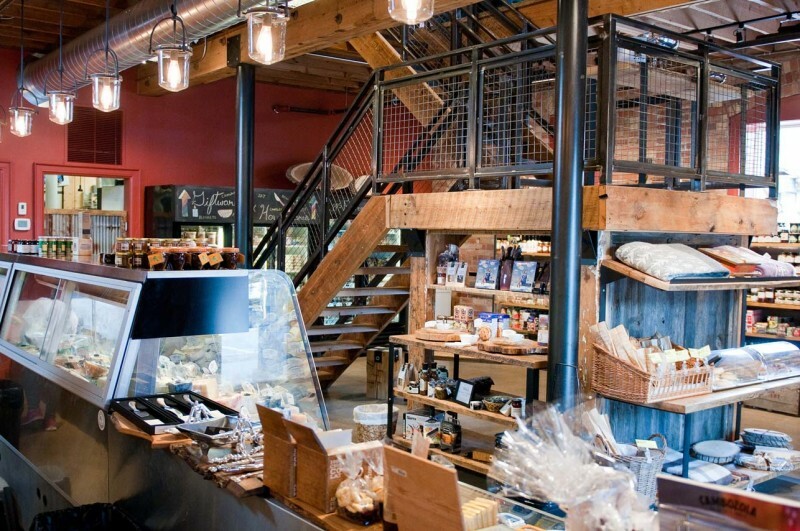 Bothwell Cheese has been in the shop since the beginning. Canada is known for its Gouda and Cheddar, so they kept the search within our borders, and that’s how they discovered Bothwell. After trying the Maple Smoked Extra Old Cheddar they’ve continued to carry it, along with summer BBQ favourite, Horseradish Cheddar. 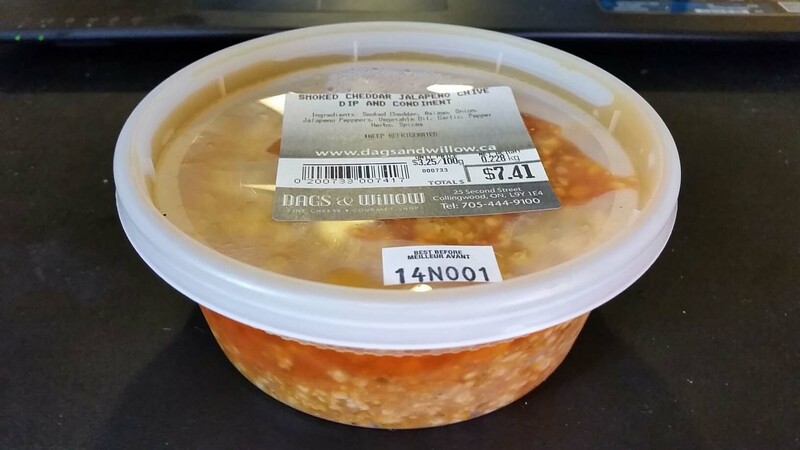 They’ve even created a special dip called Smoked Cheddar Jalapeno Chive featuring Bothwell Maple Smoked Extra Old Cheddar. While shopping for cheese can be intimidating, with all the different varieties and fancy names you’ve never heard of, Dags & Willow makes it easy for even the most amateur cheese lover to navigate their way around the cheese case. Every cheese featured has a card with its name, price, country of origin, and a brief description of its texture and flavour. You’ll leave full of facts, and probably cheese! Respected as the cheese experts in the community, most locals come to Dags & Willow to have a cheese board specially made. The staff is very helpful and takes pride in creating custom boards, from tiny cubes so you can try a bit of everything, to large wedges if you want to gorge out on your favourites. Their cheese boards are works of art, a mix of textures and milk types, with accents of dried fruit and garnish. A party-ready cheese board. To create a board that’ll impress, mix different milk types, textures, and add nuts and berries as edible garnish. 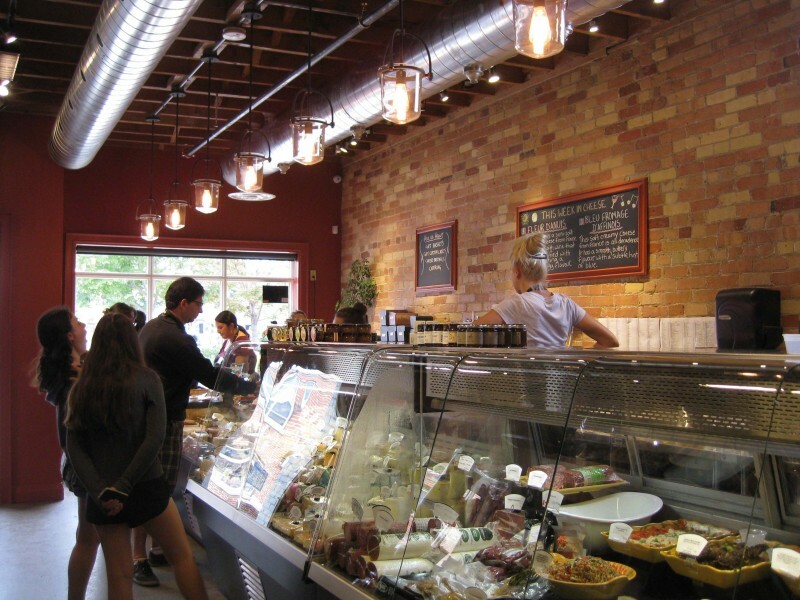 Dags & Willow is more than just a food shop, it’s a place to celebrate good food. The upstairs is a licensed venue that can accommodate up to 30 people. They’ve hosted few popular tasting dinners with local chefs. When the space isn’t being used for events it’s showcasing local artwork, such as Steve the Potter, painter Rob Saley, and pyrography artist Alexandra Glueckler. 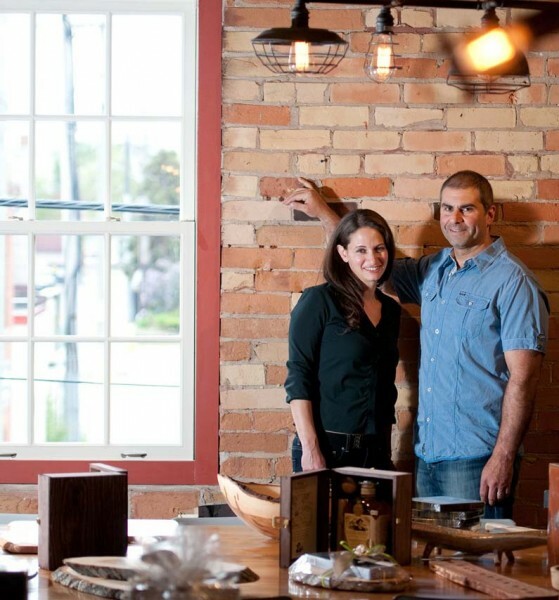 It’s also a good place to find unique serving ware, with their specially curated collection of cheese boards, from hand-crafted wood to one-of-a-kind stone slabs from made from farm fieldstones. 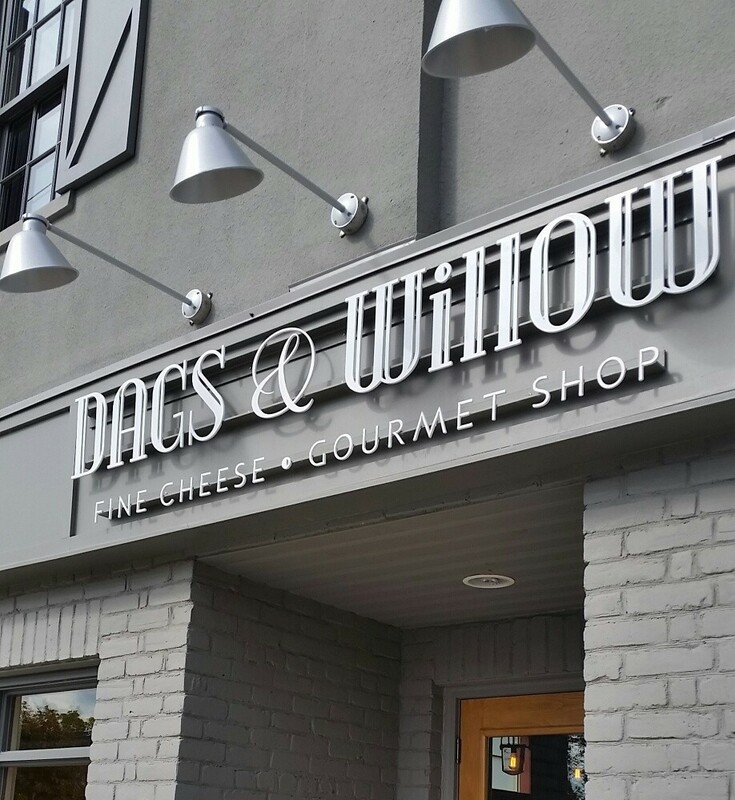 Whether you’re a cheese connoisseur or someone who just loves eating classic cheddar cheese by the brick, Dags & Willow is worth the visit. It’s the kind of shop that sparks new love affairs with cheese, and rekindles old ones. This cheese fondue is a wonderful twist on a classic, created by the kitchen at Dags & Willow. Cut the clove of garlic in half and rub the fondue pot with the open side. Pour in the beer and when hot, not boiling, add lemon juice. Dredge the cheese in the cornstarch and add the cheese in handfuls to the beer mixture. Stir constantly on medium heat with a wooden spoon and wait for each portion to melt before adding the next. Bring to a bubble and add the Whiskey. Serve with cubes of crusty bread, blanched broccoli, lightly roasted mushrooms and red pepper, cipollini onions, and ENJOY!